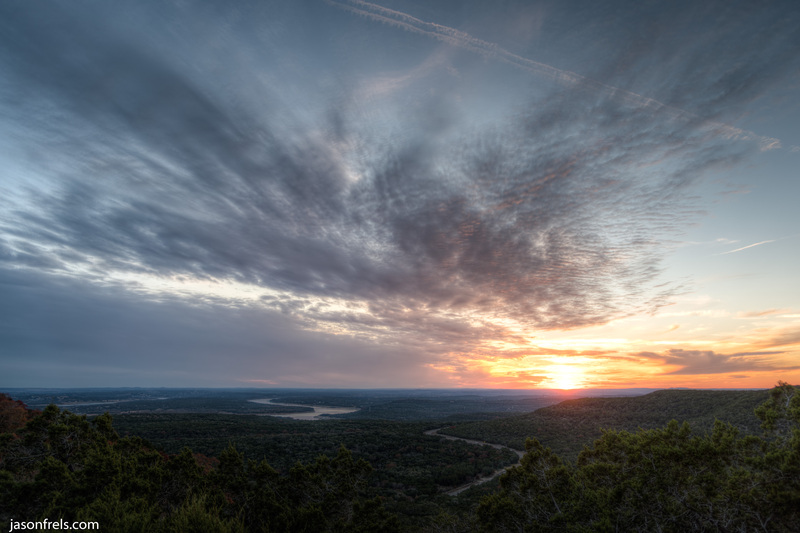 Not far from my house is a place called Balcones Canyonlands National Wildlife Refuge. This place exists mainly to protect the habitat of some endangered songbirds, but it also has several hiking trails. I have lived in Central Texas for more than 15 years and have not been out there, so in mid-December I went. 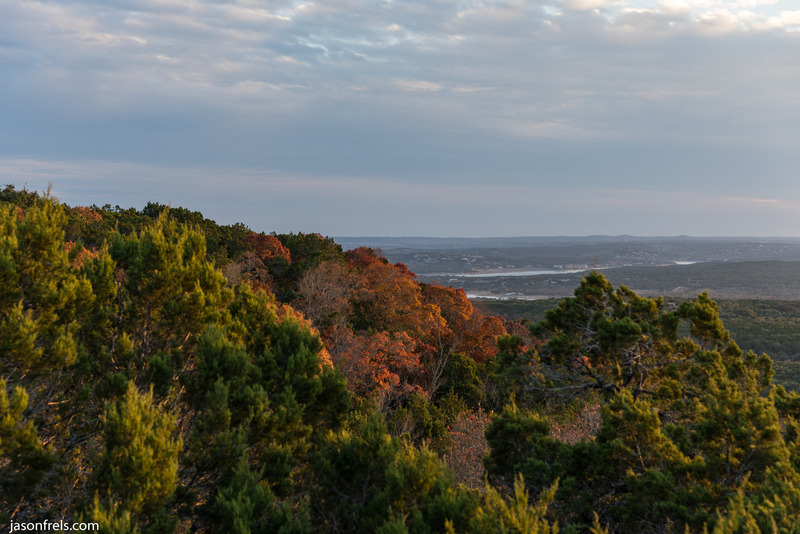 The hiking trails that I visited on this day are on a hill that overlooks part of Lake Travis. I didn’t see any songbirds, but there was a little fall color left in the trees mixed in among the evergreens. It was a mostly cloudy day, but I did get a little afternoon sun from the West. As the afternoon progressed, it appeared that there would be a nice enough sunset, so I went to the sunset deck that they have set up and waited around. There were a lot of high clouds that I thought would catch the sunlight as the sun dipped beneath the horizon. Below is an HDR merge of several photos so that I can get the bright yellow setting sun and the darker clouds and hillside. You can see part of Lake Travis and highway 1431 in the distance and the sun just beginning to light up the underside of the high clouds. Another photographer that was there for the same purpose complained about the con-trails in the sky, but I don’t really mind them as I think that they are just another point of interest. I kept shooting for a while, watching to see how the clouds would develop after the sun had set. Sometimes they are spectacular, and sometimes the sun just goes away without much fanfare. I did manage to get some bright red-orange clouds in the distance after the sun had set making for a nice picture. 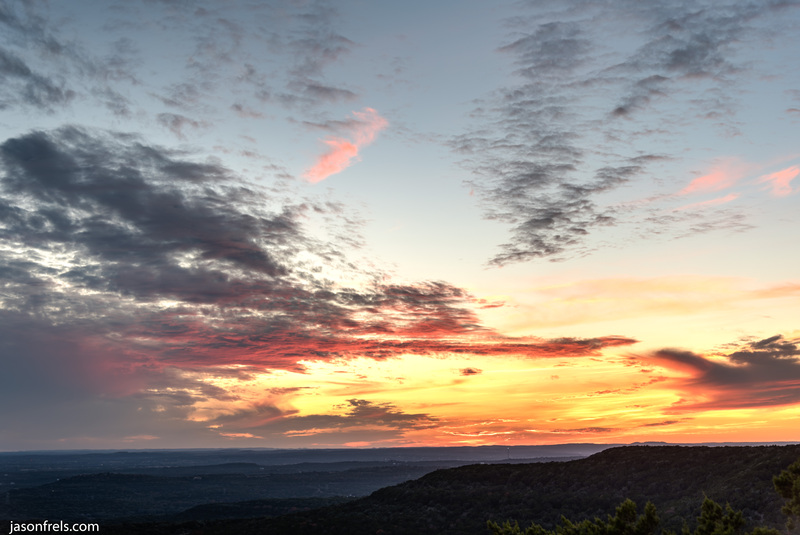 Both of my above sunset pictures are HDR merges of 6 or 7 exposures. I did this in manual mode, using a tripod and a remote shutter release. I would find where I got good data on one end of the histogram and then increase or decrease the shutter in stops (doubling or halving shutter speed) until I got good data on the other end of the histogram. I later merged the photos by exporting them from Lightroom into Photomatix Pro. I tried to select merges that looked as natural as possible. I do like to try to make nice HDR sunsets. There are a lot more hiking trails at this wildlife refuge and I will be returning in the future to get more familiar with the place. Thanks for reading.